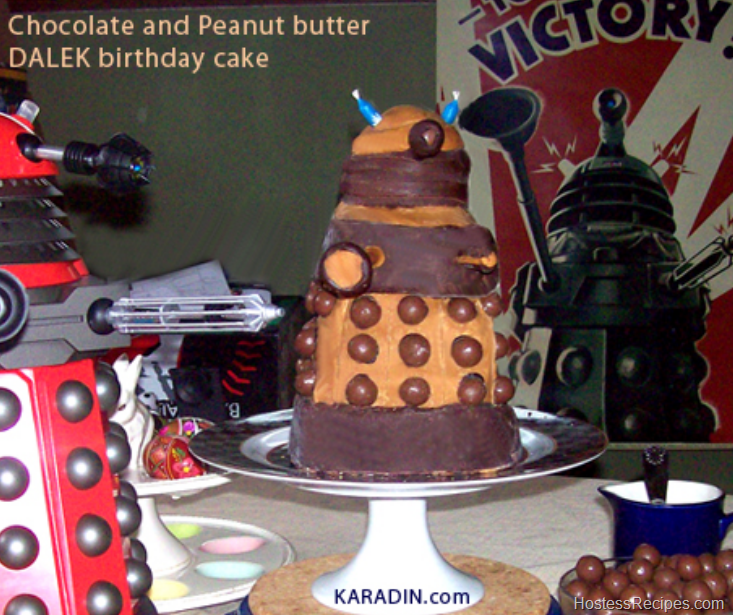 Since there does not appear to be any ready made Dalek cakes in the store, we will have to construct one ourselves. 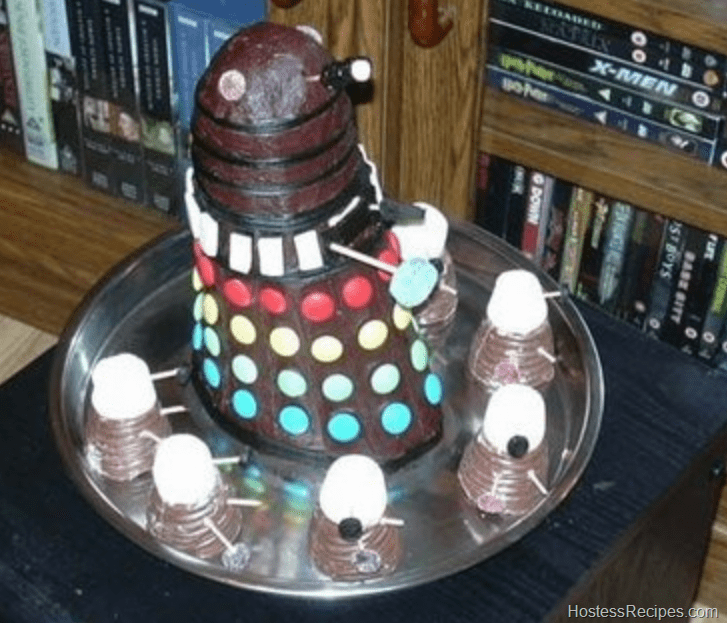 Feel free to substitute anything you like, basically buy all the chocolate snacks you can find and you will be able to make this awesome sci fi lovers cake. There are two possible methods to follow with regard to this recipe; one. Read the following instructions or two. buy as many chocolate items as you can carry home in a large family estate car and simply make it up as you go along. * You will require only a few of each of the above. I bought multi-packs, just in case. Now, stick the smaller cake on to the top of the uncut one. Anticipating a large and heavy cake I erred on the side of caution and used a large dollop of the melted chocolate to sandwich these together. Place the swiss rolls on top of the cake using, yes you’ve guessed it, melted chocolate, place a single piece of swiss roll on top of this and then start to cover the entire cake in melted chocolate. If you have the time, do this in layers, allowing one layer of melted chocolate to set before adding the next, and the next… I didn’t have the time so I poured the entire ½ thick chocolate on in one go. This proved rather frustrating as it continually gloops to the base. 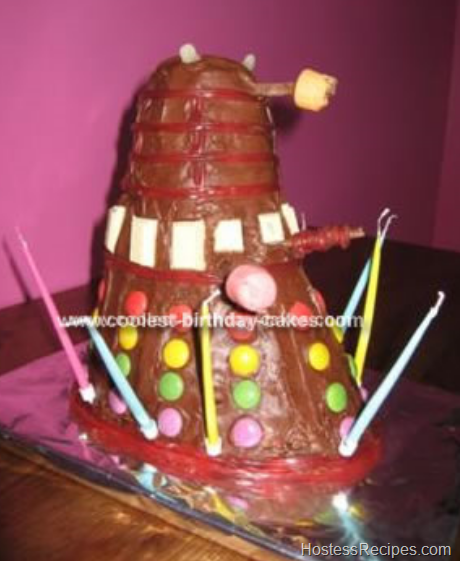 Before the chocolate sets completely (I was slightly insane by this point) start decorating the cake to give it it’s Dalek features. Place Maltesers in columns on the bottom half of the cake to form the skirt. 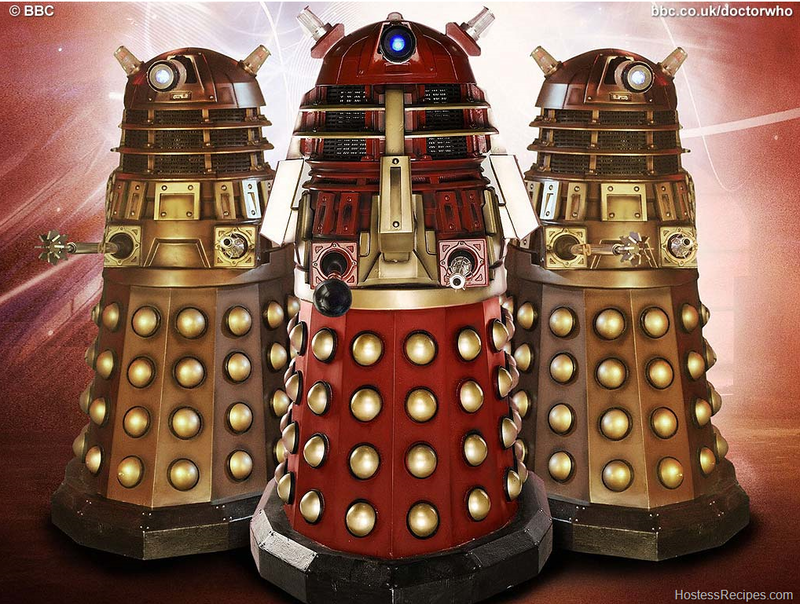 Do Daleks wear skirts? Stack three Jaffa Cakes on top of the cake, followed by two stacks of three chocolate buttons. Add a Smartie to the top of the buttons. Place a band of white chocolate squares around the neck. You could of course pipe some melted white chocolate to create a similar effect but time was running out for me; birthday boy was about to come home from school and there I was, covered in chocolate and I hadn’t even started on the proper party food yet. 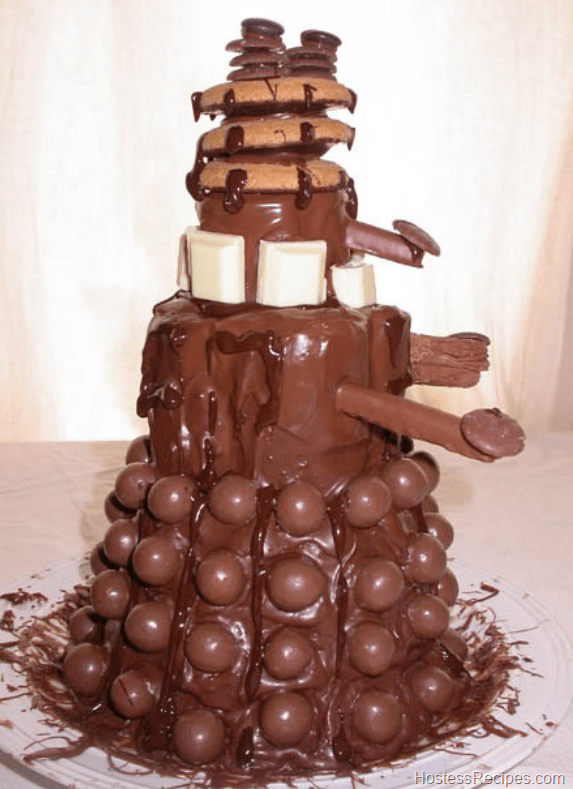 Using melted plain chocolate, pipe details around the Dalek; stripes down the Jaffa cakes, and lines between the Malteser columns for eg. I made an effort to do this, but I know you can do better.